Looking for a different golf trip destination this coming Fall or Winter? 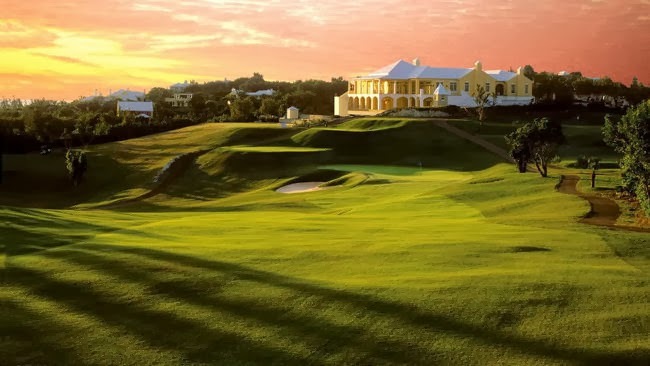 As you begin planning an upcoming golf trip, consider a Bermuda Islands package that includes perfect golf weather, great accommodations, spectacular golf and now best value through Golf Zoo! Having visited this unique and beautiful place, playing golf, touring various hotels, Resorts, and Bermuda recreation spots, I clearly see how the Island will become a popular golf trip destination! The key to a great Bermuda golf vacation is to travel between November - March time frame. Your trip will be great as the weather during this time is comparable to Florida, Arizona and Caribbean Island destinations, plus golf courses are in great condition and costs are lowest during "low season". Don't be fooled by the low season description - it is considered low season because majority of typical vacationers travel to other destinations for warmer beach settings. But, as golfers, we simply are looking for good accommodations, great golf, daily sunshine and temps in the upper 60's to 70's and good value! Located in the middle of the balmy Gulf Stream in the Atlantic Ocean, Bermuda is only 640 miles off the coast of North Carolina, and about a two-hour flight from many eastern U.S. and Canadian cities. This little oasis of rolling terrain, pristine golf courses, pink-sand beaches, and turquoise-blue waters is a combination of slightly British, slightly American and very Bermudian. With seven top-end Golf Courses, this tiny island has the highest concentration of courses per square mile than anywhere else in the world. Golf Zoo can include all seven courses in a custom golf package for your group. Small, elevated greens are often guarded by sand traps to catch a wayward approach shot. Bermuda's topography is very "hilly", or actually a quite rugged. Very little flat land can be found. Elevated Greens and tees provide spectacular views of the ocean, rocky shorelines, cliff tops and pink sandy beaches. Irrigation is very limited so the greens and fairways are always firmer and faster than those found elsewhere around the world. And as you would imagine, water - the Atlantic Ocean and various ponds that dot courses, play a huge part in the layout of almost all of Bermuda's golf courses. Windswept cliff tops, steep ocean drop-offs, and breathtaking views are the highlights of play everywhere. Port Royal Golf Club - The first six holes roll through steep hills and tropical vegetation, but the par-5 7th turns left toward the Ocean and rises to an elevated green with only blue water as backdrop. The 160-yard (white tee), par-3 8th will require an accurate shot as a ball hit to the right, or long will find its way down the steep, craggy cliff to the beach and ocean below. But the signature hole is the 235-yard (tips) 16th, which sits on the edge of an ocean cliff, and simply requires a precision shot...after the group photos complete. Turtle Hill Golf Club at Southampton - Perhaps the world's best 18-hole par-3 course, in fact, Golf Digest gives this scenic hillside course a 4-Star Rating. A challenging short course, but very fun to play and perfect for a departure day morning round! Riddell's Bay Golf Club - Bermuda's oldest Golf Club - built in 1922. This par-70 links-style course winds along a peninsula between Bermuda's Great Sound and Riddell's Bay. Shot-making and ball position is key to scoring well at Riddell's Bay, especially the #1 Hdcp par-4 8th green (surrounded by water), and the par-3 17th that requires an uphill tee shot to a severely sloping green surrounded by pond and deep bunkers. Belmont Hills Club - A "sneaky long" 6,100 yard course requires good tee shot placement and precision short iron shot-making. Many holes offer great views of Bermuda's Great Sound and Hamilton Harbor, especially the steeply downhill par-3 17th that drops nearly 80 feet to a small green. Tucker's Point Golf Club - Significant elevation changes create a challenging and incredibly scenic golf round. A great risk/reward course with several par four holes that will make you want to "gamble". The 315-yard steep downhill, dog-leg left par-4 12th hole is drive-able; miss the green left and you could get a favorable right bounce to the green, but miss right and you have donated to Harrington Sound. Play the par-4 17th from the back tees (315 yards) for the incredible island and ocean view. Go for the green. Even if you don't pull off the shot, you have the view, and only a short shot to the green. Mid-Ocean Club - The holes playing along the rugged edges of the ocean such as the 200-yard par-3 17th, and the 420-yard par-4 18th will test any player skill, especially if the wind is blowing. Most holes play across, and up-and-down considerable elevations leaving various blind shots. Built in the early 1920's, and continuously ranked among the Top-50 Courses in the World, Mid-Ocean has a long and storied history. Winston Churchill and Dwight Eisenhower favored playing the course, and Babe Ruth is said to have carded a double-digit score on the difficult, 430-yard par-4 fifth. For good accommodations with great location and top-end amenities we recommend Fairmont Southampton, Fairmont Hamilton Princess, Newstead Belmont Hills Resort, Tucker's Point Resort, and Coco Reef Beach Resort. Full profiles and property pictures can be found on the Golf Zoo website. I have stayed at all these properties and each one is unique in style, comfort, offer great dining and lively lounges, and all share excellent, friendly Bermudian service. Bermuda has a wide variety of dining choices that is North American and European influenced, but fresh seafood dishes and Bermudian special dishes are hard to beat. Wherever you choose to stay in your golf package, the lounges are energetic and the locals very friendly. You will also be "required" by the locals to try two Bermudian specialties - a Dark 'n Stormy (Gosling's Black Seal Rum mixed with Ginger Beer)...and the Bermuda Rum Swizzle! Rental vehicles are not available, the best way to get around is by taxi, or local transport van shuttle (for larger groups). The government regulates taxis, so most are very clean, air-conditioned and very friendly and knowledgeable drivers. If you like a particular driver, get a business card . The driver will pick you up whenever, or wherever you need a ride. I am glad to share some information on my experiences in Bermuda. Simply, the destination is a great golf trip destination, and economically-speaking, a comparable value October-March to U.S. and Caribbean warm-weather destinations. Give us a call for additional Bermuda golf package details and ideas. Through our continuing commitment to destination knowledge, we take the 'unknown" factor out of golf travel for you. 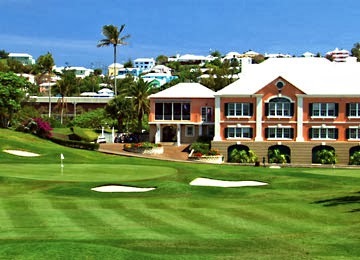 As such, Golf Zoo is proud to be the leading golf package provider for groups traveling to Bermuda! These apps will come in handy during your next golf vacation, whether you’re using Android or iOS. Be familiar with the rule of the game before heading to your next golf trip. This Rules of Golf by R&A app will serve as your quick guide to the rules of the game and the good news is, it's free! This app provides the official, fully-illustrated rules right up through 2015. This app is available for Android and iOS users. A GPS rangefinder and a digital scorecard all in one app? Sweet! Swing by Swing Golf is free for both Android and iOS users. This app also allows you to sync your data with a website for a detailed review of your stats. For $77/year, you can also get some upgrades for a comprehensive evaluation of your swing. Free yourself from worries of getting caught in the middle of a bad weather during your golf trip. With 1Weather app on your Android devices, real-time local weather forecasts are just a few taps away. This app also tracks storms with its live, animated weather radar, provides warning system, and gives you 7-day extended forecasts. It lets you save multiple locations as well for easy access, so you can keep track of the weather wherever you are. For iOS users, the AccuWeather app is for you. It keeps you updated with hourly, daily and weekly weather forecasts. This app also lets you to upload forecasts on your phone's calendar and remind you of the incoming snow or thunderstorm. Can't get enough of golf? Golf Channel Mobile app will serve you right whether you're using an iOS or an Android. This app keeps you in-the-loop with the latest news, articles, blogs, and analysis from various professionals and insiders. Plus, you can watch videos, stream the Morning Drive, keep track of your favorite players, and get some tips from best instructors of the sport. All of these are free with Golf Channel Mobile. In the mood for tee time but it’s raining outside? Well, playing golf in your smartphone isn't a bad idea at all. Try this mobile golf game called Flick Golf and it will give the golf game you’re craving for. This app is in high resolution, 3D, fully detailed and equipped with tricky courses. You can also keep track of your scores through the in-app leaderboard and see how well you do with your game. This is FREE for both Android and iOS users. These are just few of the apps that could help you during your golf vacation. So what are you waiting for? Give them a try and see it for yourself. Frequent golf vacationers want nothing but a better game each time they visit a golf spot. And to achieve this goal, some vacationers turn to various gadgets marketed to have the potential to improve your golf. To name a few, there’s swing-optimizing smart watches, data collecting e-caddies, and hovercraft golf carts. Unfortunately, all these golf dedicated devices tend to be practically expensive and can only be used when a golfer hits the link. Fortunately, Microsoft teamed up with a distinguished company called TaylorMade and came up with golf-related apps that can be used on a daily basis – whether you are at a golf spot or not. The result of such collaboration is an analytics app that works with Microsoft Band fitness tracker. For the uninitiated, Microsoft Band features a Golf tile that is fitted with algorithms, GPS, and accelerometers. This way, it can automatically calculate golf scores for every round. Microsoft, the high-tech company behind this app, prides that Microsoft Band is smart enough to differentiate a practice swing and an actual shot. It features sensors programmed to detect impact of the ball to the club. In addition, it can also fill in scores once it senses that the player has taken his last shot on a hole. Users of this app need to manually record scores if other players are not using it yet; but it really acts like an invisible scorekeeper. Scores for each round of game played while on golf trip as well as GPS data are linked to a carefully researched and well-tested analysis tool called myRoundPro – a software based on an internal tool that was developed by TaylorMade to test club performance on actual golf courses. For the record, members of the UCLA golf team have been using this technology to analyze and improve golf performance – but this is the first time it was tied to a consumer product. So what does myRoundPro do? Essentially, such system provides every golfer a mapped-out view of every round of golf played. It offers a sliced-and-diced data for every shot and swing executed – without any special golf ball or anything attached to the club or whatever gadget other than the fitness band itself. Interestingly, myRoundPro tracks distance covered for each drive, the average score over time, as well as the number of fairways hit. It also maps out each shot on the overlay of the course played. The best thing about this app is that it is fully automatic, requiring only a few manual steps to set up. Golfers only need to search and select a course from TaylorMade’s 18,000 golf vacation spots in the Microsoft Health mobile app. Players would later have to select the tee box they plan to use for each round. Afterwards, golfers can practice swing to calibrate the system and get it ready for many more rounds.